The Nintendo Switch has some fantastic qualities - the games, the portable and home console mix, and its smart, sleek design - but it does have one glaring issue: the storage space. We've said it time and time again, but the console's 32GB internal storage (which gets reduced by the operating system before you can even touch it) just isn't enough to hold all of your favourite games. Luckily, micro SD cards are here to save the day, and these officially-licenced options have just seen a rather welcoming price reduction. If you'd like an SD card with a bit of style and glamour, these Mario Kart and Legend of Zelda designs (featured on the packaging, too) might just be for you. Both are available from Amazon and, at the time of writing, are priced at £17.99 / $17.91 and £29.99 / $29.99 for the 64GB and 128GB models respectively. Of course, these aren't the most cost-effective cards on the market - whenever an SD card features official branding, you'll usually see a bit of a mark-up in price - but they definitely look the part if you're wanting to showcase your favourite gaming characters. If you're looking for alternatives or help with buying the right card for you, feel free to check out our handy Best Nintendo Switch Micro SD Cards guide. Will you be snapping up either of these cards purely for their designs? Let us know in the comments below. A normal 128gb card is about ten bucks cheaper, but that one doesn't have a mushroom on it. I mean, you cannot even see the SD card in your Switch? I'm waiting on a good sale for the 400gb late this year. Should go under $60 and then I'll bite. In need of a card but at minimum a 200GB; prefereably 400GB when price drops. The Nintendo-licensed 128GB microSD card retails for AU$170!!! EDIT: The chain JB Hi-Fi is currently selling it for $89, but that is still grossly, grossly expensive. A 200GB can be bought elsewhere for about $60. @Spoony_Tech I grabbed one for 80 last week, pretty good deal and couldn't wait any longer. Had a 128GB and I was archiving all the time. No thanks, I 'd rather keep my 400 gb sd card. While they look pretty, it's a hard pass for me. I already eyed them before, but a premium just for the Nintendo Switch Logo and a small Nintendo related artwork is just not worth the price increase. Lol, but they get tucked away in your Switch. What is the need for it?? Not terrible prices for the amounts of space, but as others have said, SD cards are some of the most pointless things to have a custom version of. Im full up on storage... bit that one has the wingcrest on it! I wonder if I could sell a kidney. There really aren't terrible prices, it's only a little bit more expensive than your usual Samsung or SanDisk microSD cards on Amazon. 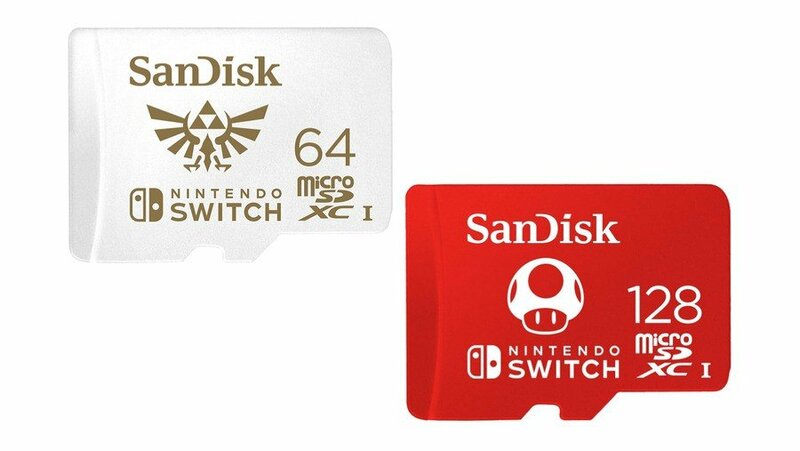 But they're pointlessly more expensive, I guess unless you're prone to removing microSD cards from their devices and you want to be able to tell them apart at a glance, then a Hylian emblem or Mushroom logo helps you to identify that this microSD belongs in your 3DS or Switch? I completely filled up my 256GB card and was starting to archive a bunch of games for space. Snapped up a 400GB card pretty recently as I found a good deal, but that'll be full soon too. These look nice, maybe get one but I already bought a 256 SD card for like $30 on Black Friday. I like the white Zelda one! What's the highest storage SD card that the switch can read? @ReaderRagfihs I assume you don't count sales like black friday or shady eBay sellers, in eu the cheapest 128gb cards I found are €26.33 and that still not a tenner less. $30 is overpriced? That sounded like a steal to me. I paid like sixty bucks for my 128 GB MicroSD card last year. Did I get ripped off? @Ttimer5 the theoretical maximum of the Micro SDXC standard is 2TB. We're only just getting to the point where a 512GB card is a consumer product, and 1TB is being prototyped by flash memory companies as we speak. I reckon it'll be at least 2022 before 2TB is even a thing you can buy. At least. Kewl, but I still have my 400 GB SD Card. They do look cool but honestly how often do you see the SD card? I don't even remember what mine looked like, put them in when you first get the system and leave it there. Even though they're only a few bucks more expensive (at least for me) don't seem worth it over a plain one. "Ah, this one should work just fine"
Up to 2TB? Wow, I thought it was just 1 TB.... I know that 1 TB micro was announced a while back. The artwork on those mini SDHC cards are great! @Not_Soos That is a great price! I got mine last year for $50 and I thought that was a great price especially since a friend of mine paid close to $70 earlier. I'm just glad Nintendo didn't go the same route that Sony did with the vita and make an exclusive, overpriced memory card. Could you elaborate on what this Ambio magic your talking about is?This is the first time i've herd about these cards having advantages over non licensed cards. No you didn't get ripped off that was sadly just what they cost a year ago. @Trellgoth I was going to totally agree with you then you gave me an idea with the second part. What if you stored your Adventure games on the Zelda one, your platformers and Mario Kart on you Mario one for instance that might be a use for them?? In fact I just want an app on the Switch that allows me to transfer games to an external hd connected to the dock. You then just swap out games for on the go as needed. They’re very nice SD cards, but they wouldn’t help me, because I can’t even fit all my games on a 400 GB card. I gotta be honest. The storage of the Switch is one of my biggest gripes. I understand why it was chosen, but I have to think we could have done better with the on-board storage than we did. Sure, storage is getting cheaper, but as large as many of these downloads are becoming, we will need multiple SD cards. If there is indeed a new version of the Switch on the horizon, I hope they fix this issue. @IHateTombs If you buy games digitally when they are physical, then of course 400 gb is not enough. But it is enough if someone who buys physical only and quite a lot of digital games that may interest them but does not take too much space. And 128 gb would be enough too if they don't buy much digital only games. @IHateTombs idk about most. I think with the Switch physical still outsells digital. 400gb should be $40ish this year. The $40 micro sd market doubles in size every year. I don’t get the point if these since you’re not going to see the logos after putting in your Switch. This isn't that bad, right? I paid 33 Euro for my Samsung 128gb. You can get it cheaper, but not by much (I think).